At the ongoing Detroit Motor Show, Samsung SDI is showcasing a number of battery technologies, including a fast-charging battery. The battery cells enables Electric Vehicles (EVs) to travel as far as 600 kilometers (373 miles) after a 20-minute charge. 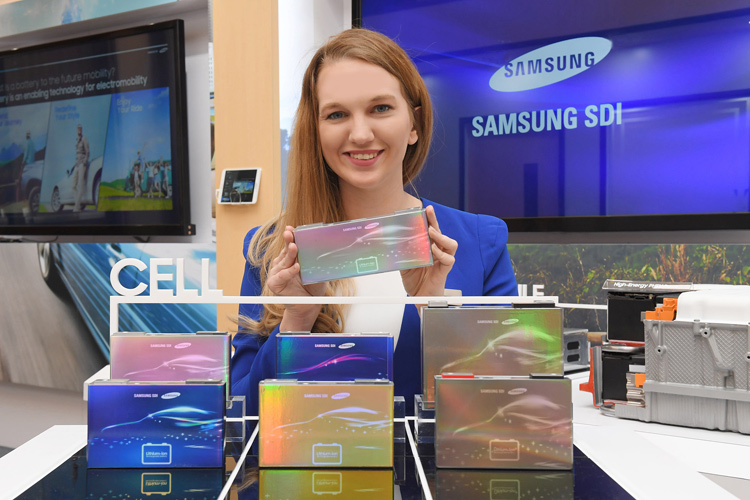 Samsung SDI also has multi-functional module battery packs on display that allow users to adjust the number of modules to capacities they need to achieve the driving distance as well as “Low Height Cell,” whose height has been reduced by more than 20 percent from existing cells. Moreover, Samsung is showing off its graphene ball tech that Samsung announced in November last year. The battery tech enables a 45 percent increase in capacity and five times faster charging speed. We will lead the popularization of electric vehicles by developing products based on cutting-edge technology which will in an optimum manner meet the needs of our customers and the market. We will continue to lead global market as the world’s top technology company providing total solutions for EV battery applications.